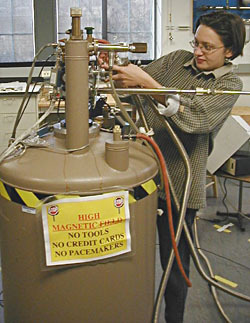 Northwestern graduate Vesna Mitrovic, now an Assistant Professor at Brown University, works with a magnet capable of generating a 3.5-Tesla field. Can the core courses be waived? Students who wish to have core courses waived must supply the Director of Graduate Studies with material from the relevant graduate coursework at a previous institution. How many electives do students take? Students must complete six elective courses in physics or astronomy. At least 4 of the 6 electives must be completed by the end of the Spring term of the student's second year. Descriptions of our graduate courses are available here. Students must maintain a B (3.0) average in the core courses (see above for details) to qualify for candidacy. An oral exam will be administered by the Graduate Curriculum Committee for any student who does not maintain a B (3.0) average in the core courses. When do students start doing research? When do students choose an advisor? Students may choose a thesis advisor and/or topic at any point in their first two years. When is the Candidacy Exam (Prospectus)? A proposed thesis topic must be defended before a faculty committee no later than by the end of the student's fourth (4th) year at Northwestern. How long does it take students to complete the degree? The thesis must be defended by no later than the end of the student's ninth (9th) year at Northwestern. The median number of years to completion is six (6) years. Can students receive their Master's degree along the way? Yes, students may apply to receive a Master's degree en route to their PhD degree. This may be helpful on applications for outside funding. For more information on the program and what to expect, please see the Program Handbook (Updated Winter 2017). Contact the Graduate Program Assistant.